That's me. I was 4 1/2 according to my mother's familiar handwriting, on the back of the photo. I am sitting next to "Ellie". 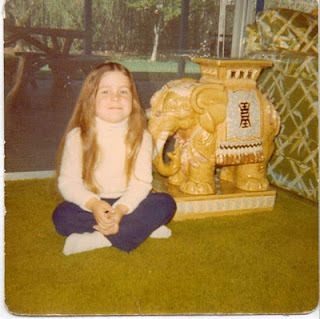 I named the porcelain elephant my mother had positioned next to her bamboo couch, complete with plastic covering. (gasp) The plastic covers on our furniture were awful. Ugly. Uncomfortable. You slid off them when it was winter, and you stuck to them in the summer. My mother used to Windex them. She had never had brand new furniture, and when my Mom and Dad made this purchase, she was determined to do what it took to stretch their life expectancy. The room was a sort of jungle theme, and the green shag carpeting was chosen to compliment the new sofa and love seat. Ellie was the finishing touch. 1975. Quite a year in home decor. When I was in 6th grade, my parents were featured in a story, in a small magazine called The Gabriel, put out by our church every month or so. They wrote about the parishioners, and covered Catholic news. My Mom and Dad were, and still are, very active in the church. My Dad was a New York City firefighter, so this seemed like an interesting story, and a church "reporter" contacted my parents, and asked if they would like to share their story, and speak of their family, and career, and faith. They agreed. I remember the lady coming over to our house, and my Dad seeming a little uncomfortable. They sat at the kitchen table, and she asked them questions for what seemed like hours. I was listening in of course, but grew bored, and lost interest. Months later, the story came out. There in black and white, were my parents! I couldn't believe my eyes. The photos and story were right there, for all to see. I thought my parents were famous. I was so excited. But my father was horrified. He looked so embarrassed, and I remember him having his head down, not wanting to look at anyone at Mass. My father had been misquoted. During the interview, a part I recall eavesdropping on, my father was discussing being a firefighter. The reporter was very impressed by this, and was really focusing her questions on him. My Dad is a very humble man, and did not want to have his feathers stroked for his career choice. In fact, he had gone on to say that there were so many more men that he worked with who were far more stronger, and dedicated, and lived and breathed being FDNY. He went on to say that he knew some guys that were so strong, they could almost tear down brick walls with their bare hands. What the reporter heard was that in order to be FDNY, you had to pass a test that included the ability to tear down a brick wall with your bare hands. At our church, many of the parishioners were FDNY. My Dad knew quite a few fellow fireman. You see where I am going with this. The ribbing, and jokes that ensued were merciless. I remember walking out of the church and hearing a man my Dad knew ask him what he scored on that test, and still another chuckling saying he must have missed that day, as he never took that test. The story crept it's way into the firehouse my Dad worked at, and beyond. My father cringed if you even referred to the story in the magazine, and bristled every time he saw that reporter. He demanded she write a correction, which she did, but the damage was done. Yesterday, I was on the front page of my local paper. It was a cringe worthy moment for me. The editor of the paper had read my blog, and contacted me asking if I would like to share my story. I was very torn. My blog is so personal. It is essentially a diary. A place where I go, and write about things in my life that are causing the course of our life, my families life that is, to shift gears, and change course. I am frustrated by the events that have lead us to be where we are, most importantly, my mortgage company, Citimortgage, and the path they have lead us down, after advising us to stop paying our mortgage with the promise of help, and then abandoning that offer. I am frustrated at all that I am witnessing, right here in my own town, with home after home, sitting empty. I am saddened by the stories I hear, from both friends, and strangers. I am tired of seeing people do nothing and not fighting these big companies for what is rightfully theirs, because they are scared, and don't think they can. I express all of that here. But I also speak of the amazing gift of my family, and our health, and our love, and how every day, we are thankful for all that we have, and never fail to realize how some days, we may feel sorry for ourselves, but we are well aware of how much better off we are than most. The headline in yesterdays paper was my first cringe worthy moment. It said my blog captured a "riches to rags story". Ugh. I felt sick when I read that. The story itself was very accurate, and I felt like the reporter did a great job, but the reference to us possibly being rich at some point, I feel I must explain. We are not rich. Nor have we ever, ever, been. The title should have been a "just getting by to rags story", because that is what we were. Just getting by. Barely. The title of my blog has always been a joke between David and I. I spent my twenties working in the fashion industry. I was never wealthy. Not even close. I barely made my rent most months. I worked my tail off, and paid my dues, which included 60 hour work weeks, with no overtime pay. It was only the last year or two of my career, that I began to see a healthier paycheck. I left that life, shortly after meeting David, and we got married, and started a family right away. We moved here, and hoped for a better life. We knew the sacrifices we would make, by me staying home, and taking care of our children. When job loss hit us, and my husbands salary was reduced by almost $15,000.00, things have gotten dramatically more difficult for us. That is where my blog comes in. It is a place that I record these struggles. I also record lots of good stuff too. All the stuff that I fear gets muddled up, and forgotten about, because of all of the stress. All of the stuff that I want to remember, but I fear I won't because my worry eclipses everything else. Opening up my blog to the general public I knew would come with a price. And it did. I received two negative comments yesterdays. One person, who chose to remain anonymous, suggested I get a job. Good point. One that I have indeed thought of, but am currently having a hard time doing, as we have the small problem of being unable to afford childcare for three children. This has presented quite an obstacle. I have found that before I go, and give my opinion of other people's life, and circumstance, and criticize them in any manner, I form my opinion by doing a little bit of research, and check my sources before I say something ignorant. You should have read my blog Heather Robinson. Aside from that, something remarkable happened to me yesterday. I was touched by strangers. Complete strangers wrote to me, and shared their unbelievable, jaw dropping stories. Women wrote to me and expressed their families were going through exactly what we were going through. Down to the job loss, and foreclosure process. One woman, named Karen, has six children, and her husband has been out of work for 19 months. 19 months!!! She said " It's sad to see that so many people are in the same exact position. What is sad though, is no one is talking about it. Two of my friends know where we are but no one else does. I honestly just told my mother last month". She also said, regarding her husbands job loss, that "It's been crazy hard and stressful and I feel like I am losing my mind every day but the kids are happy and healthy". Another woman wrote that she and her husband moved here from NYC to give there family a better life. They have faced financial hardship, and are just barely getting by. She said "from Saks to Sam's Club, know that your not alone". The e-mails came all day yesterday. While they offer comfort, they also make me sad. They make me mad at the same time. Mad that so many people are just struggling for the bare minimum. Sad for the countless families who are being destroyed by this. Mad at the arrogance of the banks and their refusal to help out people, after they themselves were helped out, and sad for the people to scared to fight them. So, am I selfish? If choosing to hold Citimortgage accountable for help they promised, and then took away, you betcha I am selfish. Selfish because I want others who feel powerless to do the same, and not lay down and die? I am. Accountability. That is what this is about. Lot's of us are out here trying to do the right thing, and being prevented from doing so, by banks, and attorneys. Not fair. Not fair at all. Selfish for wanting to keep a roof over my kids heads?...I am guilty of selfsihness, yet again. I laid in bed last night. In the middle of the night, David reached over, and touched my finger tips with his own. His love, and the gift of my family, is what I am certain of. Our future, is the uncertain part. Sometimes that eclipses this. I thought of Heather Robinson in the middle of the night too. Why was her ignorant, uninformed judgement, weighing on me more than the countless letters of the good company we are apparently keeping? Then I thought of the jungle living room of my childhood. I thought of the awful green couch, covered in thick plastic, that gave it more years than a circa 1975 couch ever should have had. Thank you Mom for encasing it in plastic, and preserving it so well. And Heather Robinson...if you know anyone who would like to buy an almost 40 year old couch, held up by books, and a television hand me down, that takes VHS tapes, let me know! know that i send the best, positive energy your way whenever i think about you guys or read your blog... let's hope 2011 is the year it all turns around BEFORE david has to go abroad. I read your blog and the newspaper story... and I personally think you are an amazing, articulate, sensitive, highly intelligent and classy person. It saddened me to read that you received a few awful and hurtful comments... Why certain people feel the need to be so negative and lash out at people they don't know or haven't even taken the time to understand is beyond me. However, your post in response was superb. Keep writing! Don't be deterred by anyone's negativity. Some people are so consumed by their own self-hate that they can't stand to see anyone else succeed. Your writing is a gift, and I personally want to take this opportunity to thank you for taking the time to share it with perfect strangers like me. First, is there someone who could tell me how to read all the posts by Erin and responses by folks on one page in chrono log..order ? Why would anyone knock this lady and family. This is not one persons story, this is millons of people's story . It is like blaming the poor people from the depression who stood on food lines. Our great country is simple becoming a country of haves and have nots! You will not see middle class neighborhoods, it will be mansions and slums, that is it ! When people are paying: $4 a gal for gas, $3.50 a gallon for milk, 10 x in school and real estate tax what they paid 15 years ago, $3 per shot to take ur money out of ATM, $30,000 dollars for cars that were $14,000 10 yrs ago, Electric and oil costs to heat a home that r now avg $350 a month, and more, it is not her fault. Here is the kicker : the folks charging these fee's are getting richer and richer, and the folks trading these commodoties on wall street are making money hand over fist wheather prices go up or down ??? I am sorry, I lied. Here is the kicker : these fat cats above are then saying , we need more , give us your tax money bailout so we can keep the private jets, retreats to Bahama's, and huge bonuses coming in. You ask Erin to cut back, or get a job(even though stay at home Mom is a job), why not ask the huge companies and banks to lower the prices, and stop gouching the consumer. I am all for free enterprise and making money, however these companies gave up that right when they took Erins tax dollars to fuel the Jet with one, yes one executive on board. Remember the CEO of GM, Ford,and Chrysler took their private jets , eventhough they said they were busted broke, to meet with Obama for a bailout.Much smarter people then myself then wrote stories on why the broke CEO is flying company private jet ?. Should Erin and others sell there 20 yr old couch, or scrub floors to produce more tax dollars for less a week then day care would cost her, just so the CEO of GM and Goldman Sach's don't have to fly coach ? Hell, they could really slum it and fly commercial first class, even that would cost less of our tax dollars.